Innovative “Roman arch” frame design is lightweight while providing excellent support, stability and style. Center-folding cushioned seat is durable and waterproof. “X” style folding mechanism for compact storage & transport. 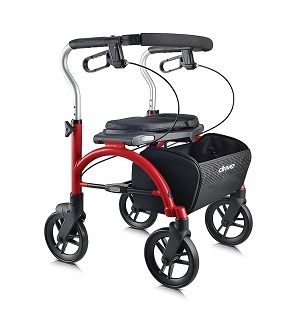 Collapsible basket allows walker to be folded with the basket in place. Durable, solid grip 8" caster wheels, ideal for both indoor and outdoor use.